The first clip from the new Alan Partridge show is here, and it does not disappoint. This Time With Alan Partridge sees Steve Coogan's greatest creation return to the BBC for the first time since 2003. The new series will see Norwich's finest co-host a One Show-style early-evening show. The clip features Alan freaking out just prior to going live on-air, and gives us our first glimpse of his new co-host Jennie Gresham (played Susannah Fielding). Both Tim Key and Felicity Montagu are confirmed to return, as (formerly Sidekick) Simon Denton and Alan’s assistant Lynn respectively. No air date is yet confirmed, though co-writer Rob Gibbons stated that Alan will return "in a couple of weeks". 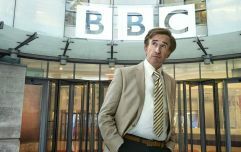 Alan Partridge first appeared in Chris Morris groundbreaking radio news pastiche On The Hour in 1991. He soon got his own spin-off chat show, Knowing Me, Knowing You, and when On The Hour was adapted for television into The Day Today he was the breakout character, getting a TV version of Knowing Me, Knowing You as well. That was followed up by two series of sitcom I'm Alan Partridge. After a hiatus, Steve Coogan returned to the character with a series of YouTube shorts that became the Sky Atlantic series Mid Morning Matters. 2013 saw the release of Alan's first big-screen adventure, Alpha Papa.